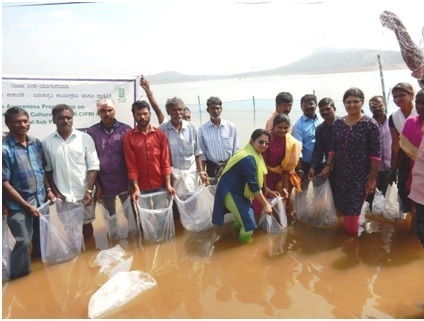 Research Centre, ICAR- Central Inland Fisheries Research Institute, Bangalore successfully organised the demonstration programme on pen culture for fingerling raising at Harangi reservoir, Karnataka for tribal fishermen on 24 th January 2019 under the Tribal Sub Plan (TSP). A mass awareness program on demonstration of CIFRI HDPE pen installation, seed stocking, pre - and post stocking management and feed management strategies were detailed to fisher folks. The species stocked were Catla catla and Labeo rohita in the reservoir. The pen structure (0.1 ha) installed in Harangi reservoir, the first of its kind in Karnataka will be mainly used for raising fry to fingerlings . The fingerlings when they attain the size of about 100 mm will be used for stocking the reservoir. About 80 fishermen of the Cauvery Fishermen cooperative society attended the demonstration programme. 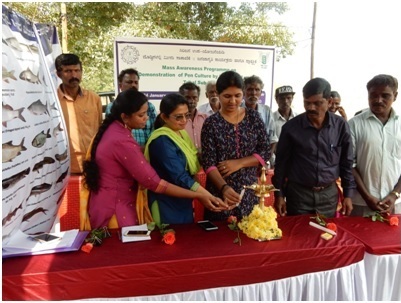 The program was attended by officials from the Department of Fisheries, Govt. 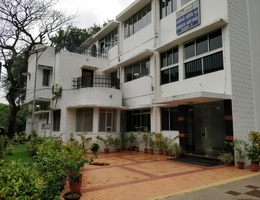 of Karnataka. 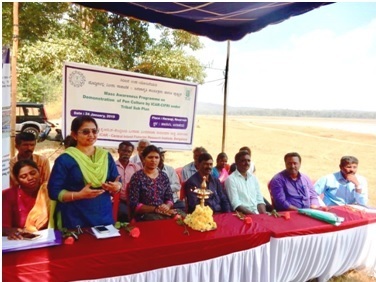 Dr. Preetha Panikkar, Principal Scientist and Officer in Charge welcomed the gathering and spoke on the advantages of the pen structure installed at the reservoir and its relevance for enhancing fish production from these water bodies for improving livelihood of the tribal people dependant on fishing. Miss. V. L. Ramya (Scientist), Mr. Vijaykumar (Sr. Technical Asst.) 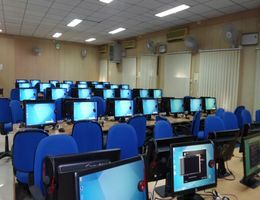 along with the support staff made all the necessary arrangements for the smooth conduct of the program. 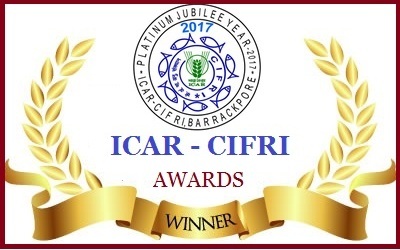 Mr. Vijaykumar delivered the vote of thanks and expressed gratitude to the Dr. B. K. Das, Director, ICAR- CIFRI, Barrackpore for the support.